Because my hopes to knit Christmas presents for everyone at work were dashed by some one's request for a secret Santa exchange, I had to find myself an overly ambitious plan for this year's holidays. So I bought four dark colors of sock yarn from Knit Picks to make some manly socks for Christmas. I am not sure if my posting about this here constitutes a commitment to actually knit four pairs of socks. I kind of hope not. But I have started the project and will have at least one pair of socks to give away. 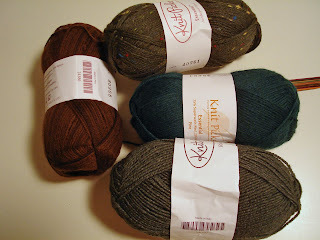 These are made from Knit Picks Essentials in a dark piney green, one of my husband's favorite colors. I was thinking brown for him, but the green was what he picked. The pattern is from good old reliable Charlene Schurch - the Fisherman's rib from the five-stitch section. The first pair of socks I made had a flap heel and were knitted from the top down. The second pair had a short-row heel (better) and were knitted from the top down. These, my third pair, have a short row heel and are knitted from the toe UP. The toe style is called easy toe. Now the toe up sock starts out with the really fiddly bits. Toes are my least favorite part of sock knitting. The advantage of toe up then, is to get the toe part over with sooner. Other than that, which is not a huge advantage, I don't see any reason to make a toe up socks. The reason given for them is in case you fear running out of yarn, you can gauge that and make a shorter leg if you need to. I guess that's a good reason, but it doesn't apply here. 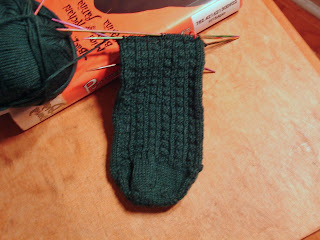 Aesthetically, I don't much like the looks of a toe up sock in progress. It looks like a floppy fish. 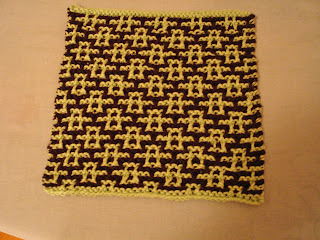 In other knitting news, I have made what I think is my 13th Learn to Knit Afghan Square. It is called miniature mosaic, and is very pretty. The color on this photo is kind of off. Breaking news - I join the Ravelympics without actually watching the Olympic games. Stay tuned. I've done a few pairs of toe-up socks, just for the experience, but I don't really care for the process. Somehow I can never reliably determine when to turn the heel. And the worst part? Binding off. Ee-ew.